As I talked to various classmates sitting next to me on who I’d write about for my report, one of them replied “Who’s Darth Vader? Is he that guy with the black boxy head?” I stared in disbelief at Alex. I asked him if he’d ever watched Star Wars and he told me, “No, not really.” I asked the other classmate next to me who had seen it if I should explain to him who Darth Vader was. “I could tell him, but I’d ruin that moment in The Empire Strikes Back” I stated. Alex told me that he never was going to watch Star Wars and that I should just tell him anyways. As our professor continued his lecture, I was busy dropping knowledge on Alex. Diagrams and plot points were scribbled on various pieces of paper on who was Darth Vader and how he came to be. I could read Alex’s eyes as he was understanding key plot points but he could not feel them the way I and others have since he hasn’t watched the movie. I’ve decided to write this paper for Alex and other lost souls who haven’t watched any movies from the Star Wars franchise. Afterwards, you should be able to see how Vader was a led astray before he became the monster we all know, and eventually found his way back to the light. Before I give you the who, what, when, why, and how of Darth Vader, I’m going to give you some basic overview information. Darth Vader wasn’t always Darth Vader. In fact his real name is Anakin Skywalker. Yes his last name should be a bit familiar to some. Anakin/Vader has appeared in at least 7 films related to Star Wars. Three of those movies (known as the original trilogy) he is mainly seen wearing the black suit we all know. In the other three (known as the prequel trilogy) his backstory is given. This is where we will start and mainly cover. In the movie The Phantom Menace, Anakin Skywalker (he’s not Darth Vader yet) is discovered on the desert planet Tatooine by jedi master Qui Gon Jin. Qui Gon along with his jedi padawan (a jedi in training) Obi Wan Kenobi are escorting Queen Amidala back to the planet Naboo when their damaged ship lands on Tatooine and parts are needed to repair it. Anakin is 10 years old at this time and is found in the repair shop of Watto. Anakin and his mother Shmi Skywalker are slaves of Watto. You can imagine what it feels like to be a slave. Qui Gon sensing Anakin’s strength in the force attempts to free him by making a gambling debt with Watto for his freedom. Anakin ends up winning his freedom through a pod race but is forced to leave his mother. Qui Gon was only able to free one of them. So Anakin is off to become a jedi but must leave his mother, who is the only family he knows and has ever had. This is a lot for a child to handle. He isn’t just leaving her for a week or a month to summer camp, he’s leaving her forever. During the trip back to the planet of Coruscant, Anakin meets Queen Amidala/Padame(who is in disguise as a handmaiden for her safety) and begins to form a bond with her. Anakin is taken to the jedi temple on Coruscant and tested by the jedi counsel to see if he is fit to be a jedi. Yoda (the little green guy with the pointy ears) asks Anakin when the topic of his mother is brought up “Afraid to lose her I think.” Anakin tells him “What does that got to do with anything?” Yoda being old and wise tells the ten year old boy “Everything. Fear is the path to the darkside. Fear leads to anger, anger leads to hate, hate leads to suffering. I sense much fear in you.” This is a key foreshadowing moment. Attachments are forbidden within the jedi order for this very reason. At the end of the movie, Qui Gon is killed and his padawan Obi Wan Kenobi promises to train Anakin as a jedi. We’re about to jump ten years into the future during the events of the movie Attack of the Clones. Anakin is roughly 20 years old and re-falls in love with Padame/Queen Amidala after seeing her for the first time in 10 years. Now as much as this feels like a summary to the movies, much is left out of other characters and we’ll continue our focus on Anakin unless it’s necessary. You need to see why he feels resentment and ultimately turns bad. A plot to assassinate her forces the Jedi council to send Padame into hiding on her home planet with Anakin which strengthens their emotional bond. Love is also forbidden in the jedi code. So you’ll see how this plays out later. Recurring nightmares of his mother force Anakin to leave Padame’s home planet of Naboo to go back to his world of Tatooine. Anakin finds out his mother was sold and married. His nightmare grows as he finds out through his mother’s husband that she was taken by Tusken Raiders(think desert savages) who tortured her. Anakin finally finds their camp and his mother only to have her die in his arms after seeing her for the first time in ten years. This is the turning point for Anakin which sends him into furious mindset. This is when the monster within begins to take his first infantile steps. He brings back his mother to her home and reveals to Padame that he killed every one of them. “Not just the men, the women and children too.” Killing in the name of anger is an act of evil. It’s his uncontrolled emotions ruling his decision making. “People justify their actions by blaming the victims. As their initial devaluation intensifies, they come to see their victims as less than human and to exclude them from the moral realm (Staub 183). Later in the movie he is on the planet Geonosis with Padame captured by Separatist leaders. Before they are to be executed Padame reveals her love for Anakin. Love is forbidden amongst the Jedi as it can create attachments. Anakin and Obi Wan pursue the fleeing Sith Count Dooku/ Darth Tyranus. 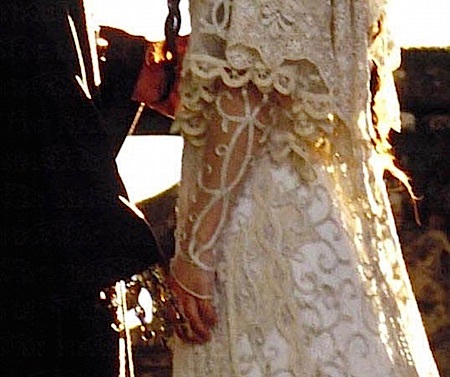 A lightsaber battle occurs and Anakin loses his arm only to have it replaced with a mechanical one seen at the end of the movie when he marries Padame. Why is the new arm important? This arm is viewed as the symbolic beginning of his transformation into Darth Vader. He will eventually lose more flesh as consequence for his actions. We now step into the movie Revenge of the Sith which takes place 3 years later after Attack of the Clones. This is the period where Anakin will make the majority of his decisions that transforms him into Darth Vader. It is also where he will be blind to outside forces seducing him towards evil all in the name of personal gain. Anakin is now promoted to the rank of Jedi Knight and is in pursuit of Count Dooku with Obi Wan Kenobi. Count Dooku had taken Chancellor Palpatine aboard the ship of General Grevious. Anakin and Obi Wan confront Dooku but before their lightsaber battle, Anakin boasts that his powers have doubled showing signs of arrogance. Traits unbecoming of a jedi. Once again during their battle, Obi Wan is knocked unconscious which motivates Anakin to fight harder. Anakin is able to block Dooku’s moves and then cuts off both his hands. Skywalker is at a crossroads. He has two lightsabers around his neck and can decide his fate. Chancellor Palpatine who has been a friend since Anakin was discovered tells him to kill him. Now this is a spoiler alert but Palpatine is a sith lord in hiding. To make this easy for you, the sith are bad. They use their powers for selfish reasons. He is also the master of Count Dooku. Anakin is at the border of rationale when Palpatine says, “do it.” He stares down at Count Dooku’s head away from his body trying to figure out why he did what he did. Palpatine sees that he is disturbed and tells him that he was “too dangerous to be left alive.” Regretting his decision, Skywalker explains that he was unarmed. To plant future seeds for his personal agenda, Palpatine tells him that it was only natural that he wanted revenge. Anakin is also reminded that he has previously lashed out when he killed the tribe of sandpeople. Anakin, Obi Wan, and the Chancellor are able to get back to the planet of Coruscant after crash landing General Grevious ship after a brief battle with him. Anakin meets up with Padame (his secret wife) to find out that she is pregnant. If having an attachment to a person such as a wife is not allowed in the jedi order, you can imagine the predicament this puts him with a child on the way. Later in the evening, Anakin is having nightmares about his wife Padme. Similar to the ones he experienced about his mother. In his dreams he sees her dying in childbirth. After a series of events, he is summoned to see Chancellor Palpatine at an opera. During this interaction, Palpatine is subtly seducing Anakin to the darkside. Palpatine secretly knows of Anakin’s situation and plays on his vulnerability. He mentions a story of an old sith lord who had the knowledge to stop the ones he loved from dying and that this could not be learned from a jedi. As the war continues, Obi Wan eventually catches up with General Grevious and the two begin to fight. The jedi council is told of this and Anakin is sent to tell Palpatine this news to gauge his reaction. During their conversation, he tells Palpatine how he feels the jedi council is hiding aspects of the force from him. Seeing this as a perfect opportunity Palpatine reveals that he knows the force and the darkside. Anakin returns to the council to inform them that Palpatine is the sith lord. The same sith lord who has been controlling the opposing army(the Separatists with Count Dooku and General Grevious) and the clone army of the republic that the jedis are fighting with. Four jedi masters are on their way to arrest Palpatine (who is really Darth Sidious). Once again Anakin is conflicted. Let the jedi masters do their job or go to Palpatine who could give him knowledge to save his wife. Anakin favors his wife and immediately rushes back to Palpatine’s office to see only one jedi master fighting Palpatine with the other three slain. 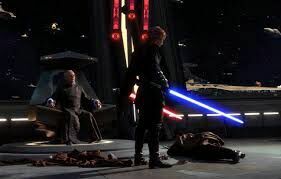 Palpatine is on the verge of defeat and death when Anakin steps in and cuts off the jedi master’s hand that once held a lightsaber. The jedi is defeated with Anakin starring once again in disbelief. His selfish actions have brought him to crossroad after crossroad. In Cohen’s Monster Culture he states, “The monstrous offers an escape from its hermetic path, an invitation to explore new spirals, new and interconnected methods of perceiving the world.” (Cohen 7). Darth Sidious(Palpatine) tells Anakin to become his apprentice so they can discover the secret to save his wife from death. Darth Sidious ceremoniously dubs Anakin the name Darth Vader. Vader wasn’t always evil walking in a suit. He will become this shortly due to his ambitions for power. To the uninitiated readers, Anakin is still wearing his original jedi robes but is now Darth Vader. Anakin Skywalker is dead and the persona of Darth Vader in unleashed. To finish off Darth Sidious plot, Vader is dispatched to the jedi temple with the clone army to wipe out the jedis. Here is where he begins to commit acts of pure evil that have nothing to do with protecting his wife. Despite killing adult jedi, he also kills younglings. 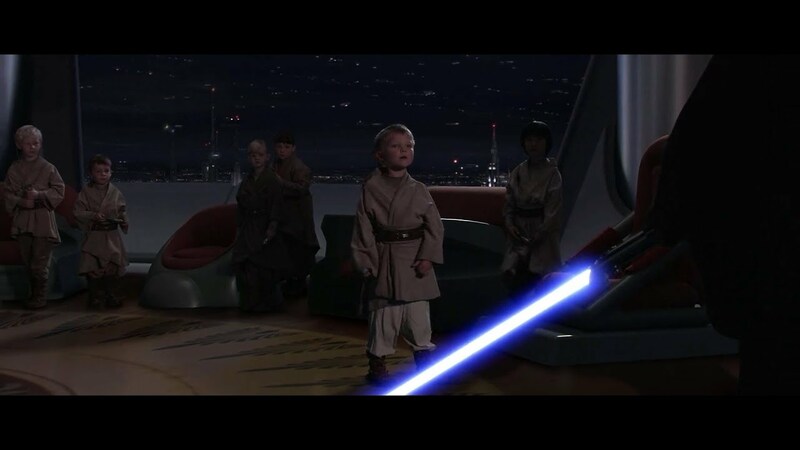 Younglings are children who are barely learning to use the force. The last time he killed children was out of revenge against his mother’s torture. After this task he is sent off to kill the hiding Separatist leaders on the volcanic planet of Mustafar. Before he leaves, he visits his wife to let her know that he’s ok. Darth Vader goes to Mustafar and wipes out the remaining Separatist leaders. His wife Padame takes a ship to Mustafar to see Anakin (she doesn’t know what he’s become yet) but doesn’t know that Obi Wan has snuck on board. When she finally lands, she confronts him about the rumours of his actions. This is where she sees in his eyes and responses about what he’s become. Vader then tells her that only his new powers can save her and he’s doing this for her. In Ervin Staub’s The Roots of Evil he states, “Individuals and groups tend to justify their actions, even to themselves; and various belief systems develop that propagate harmful actions in the service of some presumed good.” (Staub 180). He then sees Obi Wan behind her and begins to choke her using the force until she becomes unconscious. After some banter between the two, a lightsaber fight ensues. As the battle draws to an end, Obi Wan is able to leap to the top of a nearby slope. He tells Vader, “It’s over Anakin, I have the high ground.” Relying on his darkside abilities he retorts, “You underestimate my power.” As Vader attacks, his legs and non robotic hand are cut off. He tumbles down the slope towards the lava flowing below and stops just shy of falling in. A few sparks fly on him and he’s consumed in fire. Obi Wan leaves him to his presumed fate and Darth Sidious sensing Vader’s troubles through the force comes with a ship to is aide. He’s then transported back to Coruscant where he undergoes a very Frankenstein esque surgery. Psychologically Anakin is already Darth Vader. Physically he is becoming the monster that moviegoers across the world recognize. Mechanical limbs are attached and the suit with a breathing apparatus and samurai styled helmet covers his charred body. There are other plot points that come after this physical transformation (including his redemption arc in the original trilogy)but for the most part, this is the imposing creature we all know. If you’re curious as to what type of brutality Darth Vader displays in his new form, watch the last five minutes of the movie Rogue One. Big time spoiler alert. As we wrap things up, let’s look back on Darth Vader now that you get the gist of his story. Born a slave with magical powers. Finds his mother years later tortured and can’t save her. Reacts violently and kills a tribe. Falls into forbidden love and has nightmares of his wife’s death, so will stop at nothing to prevent this. Kills an unarmed man after battle. Feels the jedi are hiding knowledge of the force which could help him from his viewpoint. He turns to the darkside thinking it will save his wife, but this same path is the one that ends up killing her and his humanity. Anakin Skywalker became Darth Vader by ignoring the code of the jedi and walking the path of the light, and gave into selfish temptations. Cohen, Jeffrey J. Monster Theory: Reading Culture. University of Minnesota Press, 1996. Lucas, George, director. Star Wars Episode I: The Phantom Menace. Twentieth Century Fox, 1999. Lucas, George, director. Star Wars Episode II: Attack of the Clones. Twentieth Century Fox, 2002. Lucas, George, director. Star Wars Episode III: Revenge of the Sith. Twentieth Century Fox, 2005. Staub, Ervin. The Roots of Evil: Social Conditions, Culture, Personality, and Basic Human Needs. Department of Psychology University of Massachusetts, 1999.